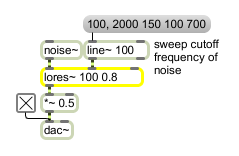 lores~ implements an inexpensive lowpass with an adjustment that lets you add a specified resonance. The middle inlet sets a kind of cutoff frequency, but the sharpness of the filter depends on the resonance passed in through the right inlet (0 is a little bit sharp and 1 as sharp as possible). initial-cutoff-frequency and response (ints or floats) list opt Numbers set the initial cutoff frequency and resonance. The default values for both are 0. If a signal is connected to the middle or right inlet, the argument corresponding to that inlet is ignored. An int or float can be sent in the middle or right inlets to change the cutoff frequency or resonance. If a signal is connected one of the inlets, a number received in that inlet is ignored. clear Clears the filter's memory. Since lores~ is a recursive filter, this message may be necessary to recover from blowups. In middle inlet: Sets the lowpass filter cutoff frequency. In right inlet: Sets a "resonance factor" between 0(minimum resonance) and 1(maximum resonance). Values very close to 1 may produce clipping with certain types of input signals. where scale, c1, and c2 are parameters calculated from the cutoff frequency and resonance factor.